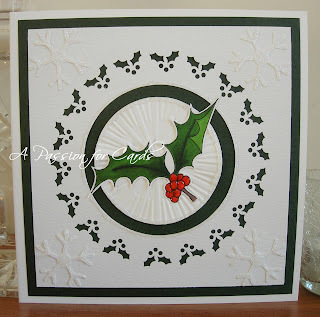 After I posted the photo of the Poinsettia card yesterday, I got several requests from other crafters asking how I had created the punched effect around the image so I decided to make a similar card and show how I did it. 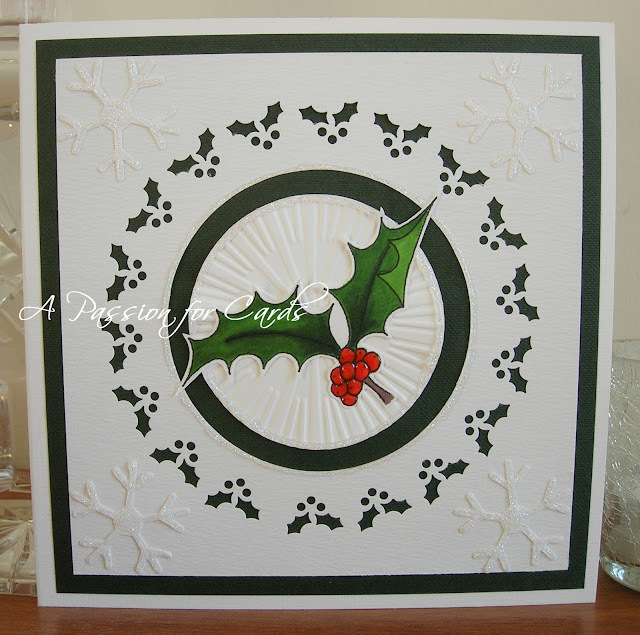 The image I've used this time is Holly from A Passion for Stamps, coloured with Promarkers and highlighted with Glossy Accents. 1. Cut a square of card/paper to fit as a mat on your card front,then cut a circle 15cm from the centre of this. 3. Line up punch as shown and repeat till the circle is filled.It's as simple as that!! so sweet and so beautiful I love it! Thank you soooo much Ruth for this beautiful tutorial!! Fantastic card....your colouring is so lovely and that holly border just looks terrific. A gorgeous card. I love the punched effect. Another beautiful and really effective card Ruth and thanks for sharing how you achieved it. Fantastic! Thanks for the tutorial - brilliant! Thanks for your lovely comment on my cards. I have popped in here to have a look at yours as I was not aware of your blog until today. Your cards are all stunning and you are a very talented artist. I will continue to pop in and see what you have added. FABULOUS, and appears so simple - when you know how!! Thanks for the tutorial. Gorgeous card and a great tut.